Kalimat Foundation has donated 2,000 Arabic-language children’s and young adult books to 11 Italian libraries for Arab immigrant and refugee children. 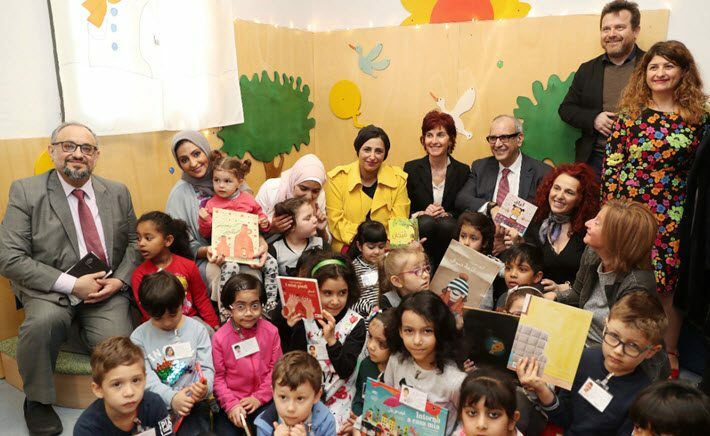 The Kalimat Foundation for Children’s Empowerment, founded in 2016 by the Sheikha Bodour Al Qasimi, donated 2,000 Arabic-language books to 11 libraries in Italy during the Bologna Children’s Book Fair last week. This is part of Kalimat’s Pledge a Library program for immigrant and refugee children who are seeking asylum in the Arab diaspora. The foundation is a humanitarian action program that’s responsive not only to issues involving reading for young people but also to political and social situations in which children may need assistance. In the case of the Italian donation last week, 1,100 books were contributed in association with the Italian chapter of the International Board on Books for Young People (IBBY), and they included Arabic-Italian books as well as purely Arabic titles. An additional 900 books were donated during the fair. 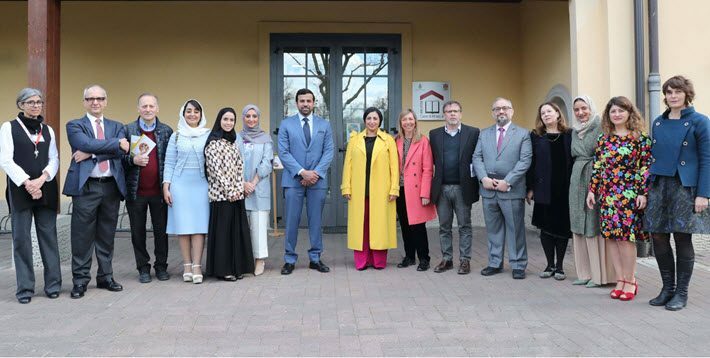 Bodour, who is the new vice-president of the International Publishers Association and the founding publisher of Kalimat, formalized the foundation’s Italian contribution with a visit to the Kahoula Library in Bologna. At the library, she met with representatives of the fair, the Italian ministry of education, and the city’s leadership. As was covered in a Publishing Perspectives Talk at Frankfurter Buchmesse in 2017, Bodour has created translation partnerships between her children’s publishing house and Bloomsbury, the Quarto Group, Gallimard Jeunesse and others. In each partnership, both publishers agree to exchange and translate a certain part of each other’s lists. Last year during the Rome Book Fair called the Più Libri Più Liberi, Bodour firmed up a new partnership on this model with Italy’s Gallucci editore. And at the Kahoula Library in Bologna, she was joined by publisher Carlo Gallucci. Gallucci spoke in Rome at the fair in December, moderating a session presented by the Aldus European Book Fair Network in which he described challenges in Italy for publishers, in part, through a reading index study that shows Italy at the bottom with 57 percent of its population reading; France leading with 91 percent; the UK at 86 percent; Spain at 66 percent; and Germany at 60 percent. Needless to say, the hurdle in Italy, where some publishers talk about a kind of lost habit of reading, is to engage as many young people as possible—and some of them now are refugees and immigrants who need children’s and YA content in Arabic. Part of the rights exchange partnership between the Kalimat and Gallucci is the production of Italian-Arabic titles, which can serve both language groups. Five of these titles are among the books donated last week. Also included are books themed on Ramadan and journeys to Mecca, as well as I Am Malala, the international bestseller by the Pakistani refugee Malala Yousafzai. The education ministry in Italy is reporting that one of every six students from an international background in the country have an Arab background. That makes them a majority of non-Italian students in Italy’s school systems. The mission statement of the nonprofit Kalimat Foundation reads, in part, “Kalimat Foundation is committed to ensuring the equal rights of all children, irrespective of their cultural background, creed or social status. The manager of the Kalimat Foundation is Amna Al Mazmi, and she says that the books distributed by the foundation in Italy were chosen with academic needs as a key criterion along with the goal of helping to create a sense of belonging and identity in an experience of displacement that can leave kids feeling disoriented. At Bologna’s Biblioteca Casa di Khaoula, Bodour spoke with library donor Mohammed Matroushi, and she was greeted by the UAE’s consul-general to Milan, Abdullah Hassan Al Shamsi, and by Rana Al Dhaheri, second secretary at the UAE’s embassy to Rome. As we’ve reported, Bodour’s base in the United Arab Emirates, Sharjah, will be Bologna Guest of Honor in 2020. On April 23, Sharjah becomes UNESCO’s World Book Capital and more on that is at a special site here. More from Publishing Perspectives on Kalimat Group and its foundation is here, and more on Sharjah and its publishing programs is here. More on the Bologna Children’s Book Fair is here, and more from us on the Italian market is here.